I’m committed to going on the regular. 2016 is the year of consistency, and for me, that means attending the JDRF adult support group every month. I went in December and tonight and I can say for me the pros definitely outweigh the cons. Perspective: Although I still feel new and often lost at times within the bunch (in person and online)-I get to meet others who are at all different stages: the veterans, the newly diagnosed, it’s really a mixed bag and it offers a lot of different perspectives. The greatest advantage is walking away after a few hours and knowing I was in a room with a bunch of people who just get it. I can’t really put a price on that or even describe the magnitude of that pro but let’s just say it’s pretty big for me. Let me stuff my face with cookie crumbs hanging from my lip. Taking 5 pee breaks during the session. No explanation needed. Mentally, it gives me a power up. Like in Mario! And now that I’ve been to the meetings enough times, my name card is set out on the table and I know a lot of faces who come to the table. I’m not as nervous as before and I can tell physically that my body is more relaxed. I’m not worrying about how I look or if I’m slouching. I’m just Jess. That type of familiarity is especially important to me since there has been so much change in my life the last while. We all want to feel we belong. We all want to be acknowledged. And this group does just that for me. Next week I have a date with two type 1 friends and when I take inventory, a lot of my close friends now are people living with type 1. That, including some of the interaction I have with people on social media, I have to say there’s a community in-person and online that adds up to something I can’t take for granted in 2016. This will be a big year for me in so many ways, and with a good team, new endocrinologist and hospital (which I have yet to meet, fingers crossed), place, and fresh new business adventures, it will be one big ride. Has a support group helped you? Who is part of your diabetes community? Sending lots of support to you need it, and even if you feel you don’t. How beautiful! A classic medieval silhouette and I can’t wear it. Can we talk about this dress and maybe gawk at it for a little? What a gorgeous piece. I wish I could put it on and do a fun photoshoot. I saw this on Etsy and just had to share for #BlueFridays. Every Friday we put on our blue accessories, clothes or whatever to celebrate and support those living with diabetes. The #BlueFridays hash tag all started with Cherise Shockley. Check out how the initiative started here. It’s backkkkk. Today’s #BlueFridays outfit. Posting this brought me so much joy. The dress I found at the thrift store made everything sweeter. Dress up in blue on Fridays to show your support for diabetes. I hit the jackpot with this dress. Sequence, beading, more beading, gold? Oh my! I show you guys an outfit at the end of each week for Blue Fridays. 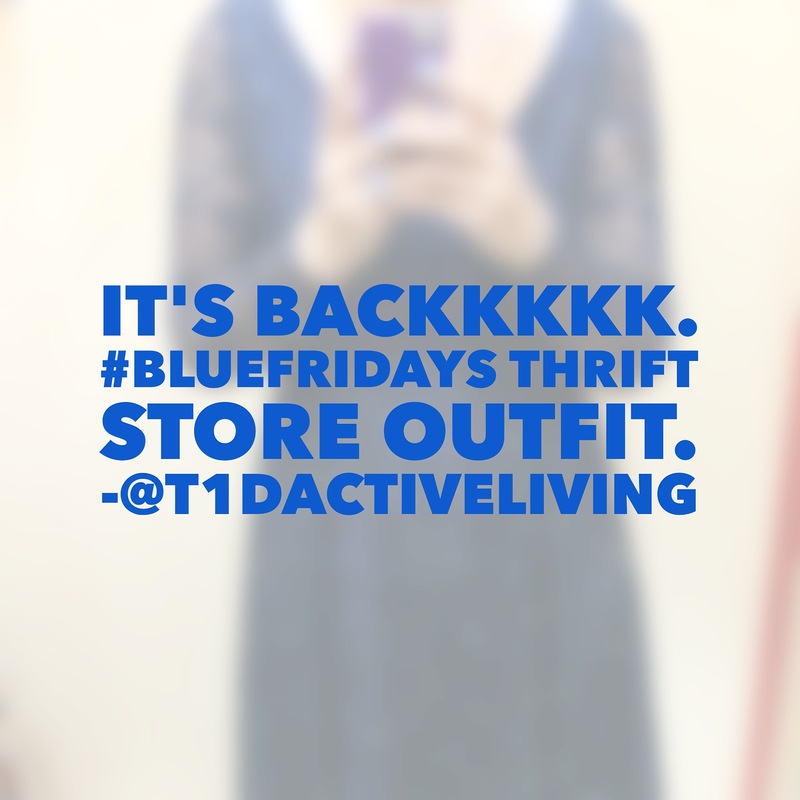 Sport any kind of blue on…well…Fridays to show your support for those affected by diabetes. Show me your blue outfit pics, hashtag it #BlueFridays and share! Thrift store dress rack find. It’s blue stripes for summer lounging. Every Friday we put on blue to support those affected by diabetes. Here’s this week’s dress. Use #BlueFridays to participate! It’s a fun hashtag to accompany your #ootd (outfit of the day). Read more about the Blue Fridays initiative here. All I need is a crown and a wand with this Blue Friday dress. Every Friday we wear blue to support those affected by diabetes. Today’s outfit is inspired by the magical. It’s part of my weekly fashion photo shoot at local thrift stores around Toronto. The Blue Fridays initiative was created by Cherise Shockley in November 2010. Read more about it here. If you’re wearing blue, snap a photo and hashtag it #BlueFriday on your social media outlets. DSMA Blue Fridays: Hold that dress up. Every Friday I show you a new, blue outfit. This week’s dress had a plunging JLo neckline. So, please excuse my hand-to-heart posing. On Fridays we wear blue to support those affected by diabetes. It’s called, appropriately so, Blue Fridays! Read more here. So get on the bandwagon, put on some blue, take a selfie and hashtag it #BlueFridays. Are you wearing blue today?